Last time I went over a 9,000 foot mountain to reach the city of Tula de Allende. Now it’s time to rest and explore the city—and its ancient pyramids. Approach to the pyramids at Tula de Allende. Photo by André. 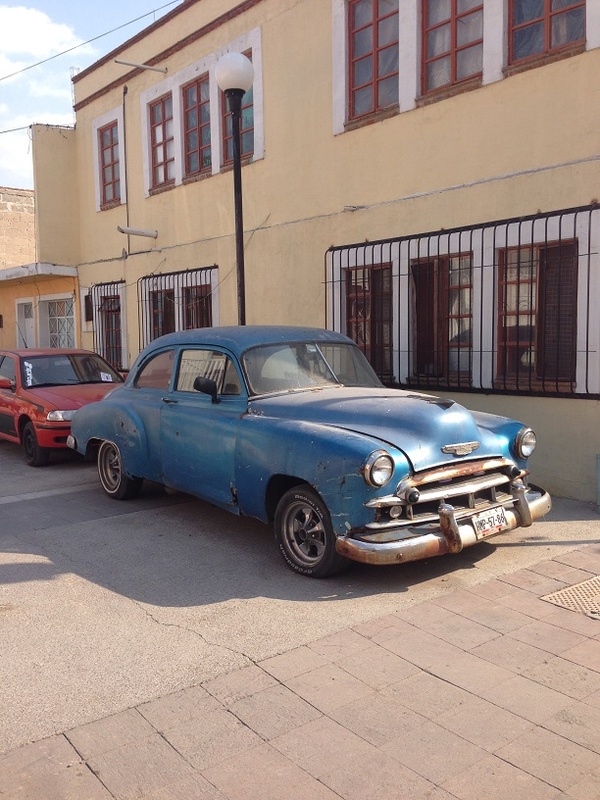 Tula still felt “different” from other cities in Mexico. I couldn’t put my finger on it. There was one of the nicest centros of any city I’d been to, with the main square surrounded entirely by walking malls. But that wasn’t it. I pondered as I wandered around looking for a lunch spot. The city reminded me a lot of Thailand. But why? What gave me the same vibe in both places? At the end of one walking mall was a torta shop (sandwich shop) that I knew I had to go into. It was on the second floor, with a tiny street level door and no advertising, yet the balcony had plenty of customers. Local secret? I squeezed in under their only sign: “Suba Ud.” Come upstairs, please. Their Cuban sandwich didn’t disappoint, except that it was twice the size of my head and way too much to eat alone. The view from the balcony, once I managed to snag a table there, wasn’t bad either. And it was there that I realized what made Tula so different from other Mexican towns. I mean, not new new. It definitely had its share of run-down buildings. But none looked older than the 1960s, and many more recent than that. Concrete and steel buildings rose from wide, well paved streets with real sidewalks. They weren’t skyscrapers, and rarely even high rises, but they were markedly different from the colonial or plaster structures dominating most Mexico downtowns. View from the sandwich shop balcony. Photo by André. Despite its size and modernity there was relatively little to do. I found two cafes worth visiting, one of without wifi and the other rarely open. 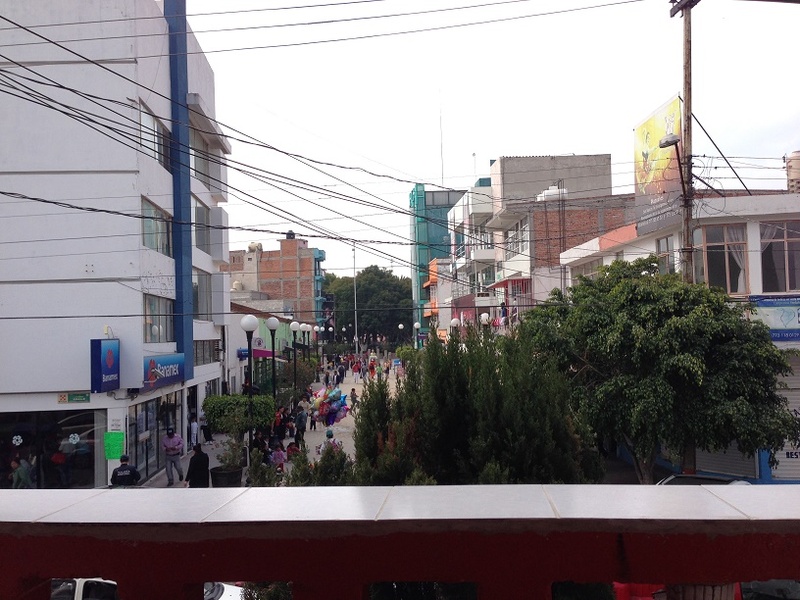 Oddly, I could never pick up a Telcel signal in the centro proper, as if the whole area was jammed by the Soviets. As a result I had to work mainly at the hotel or, one afternoon, at a second story bar with dubstep music and its own wifi. In the evenings only a few sit-down restaurants were open. Maybe it was just the adjustment from San Miguel, where there was so much to do and I had friends to talk to, but I found myself feeling lonely and uncomfortable. I went back to the Brazilian restaurant twice during my stay. Once to try out their breakfast menu, which was good, and once to experience the famed grilled meat parade. Ezra was excited for me to try it, and served me personally. He brought over sword after sword of flame-touched meats: salted beef, tender filet, succulent pork loin, chistorra, and a dozen others each more delicious than the last. Each of these is fire-roasted on the sword just seconds before serving and sliced paper-thin onto your plate. In between rounds he brought over skewers of roasted pineapple. 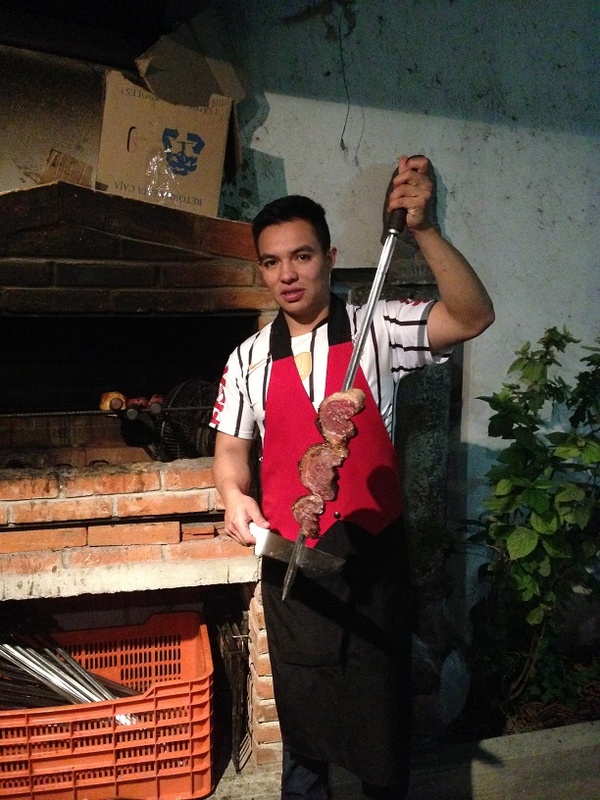 Ezra grilling meat on a sword. Photo by André. I’ve only experienced this kind of Brazilian grill once before, and I have to say Ezra’s was better. Maybe it was just that I knew how to pace myself better, or maybe it was that he didn’t try to fill me up on starters first. But at the end of the meal, instead of slow and heavy, I felt satisfied and mildly euphoric. Thanks, Ezra. Meanwhile, the owner of the Hotel Cuellar, Roberto, also made my stay more memorable. He was really interested in my bike ride, even more so after I told him I’m a writer. I’ve become well versed at explaining in Spanish what Lúnasa Days is about, but I always apologize because it’s only available in English (yet). That didn’t phase him. His English is about as good as my Spanish, and he asked if I would autograph a copy if he ordered it. I agreed, although we both knew it wouldn’t arrive in time for me to do so. My second evening there he told me that I was getting free breakfast the next day. I was a bit wowed and thanked him warmly. After the exchange, though, I wondered if I’d understood correctly. Maybe I was getting too cocky in my Spanish skills? But sure enough, the next morning at the hotel cafe the doña who runs the kitchen came out and showed me the menu for their “desayuno ejecutivo” (executive breakfast) and told me there’d be no charge. The third day was pyramid day. 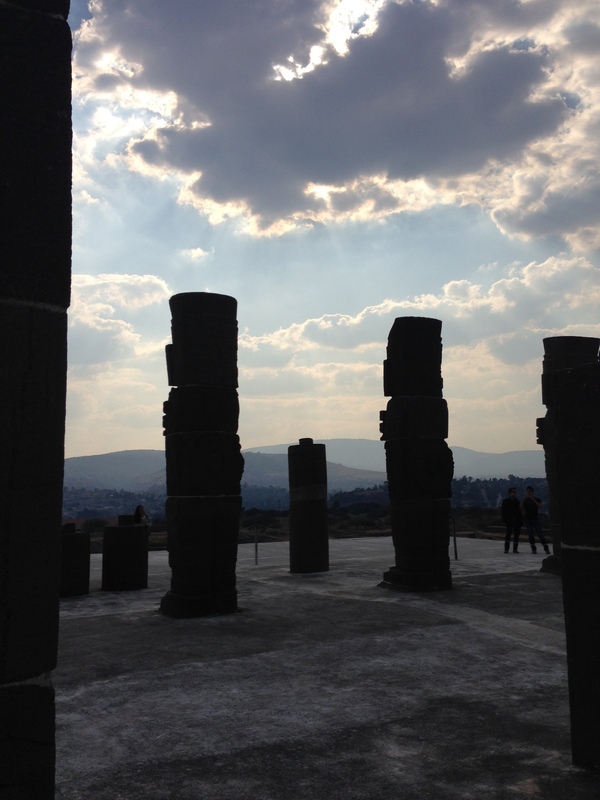 It’s funny… I’ve gone to such great lengths to see all these ancient sites. Yet on that day all I really wanted to do was hang out in the hotel room and read. Just get some R&R. 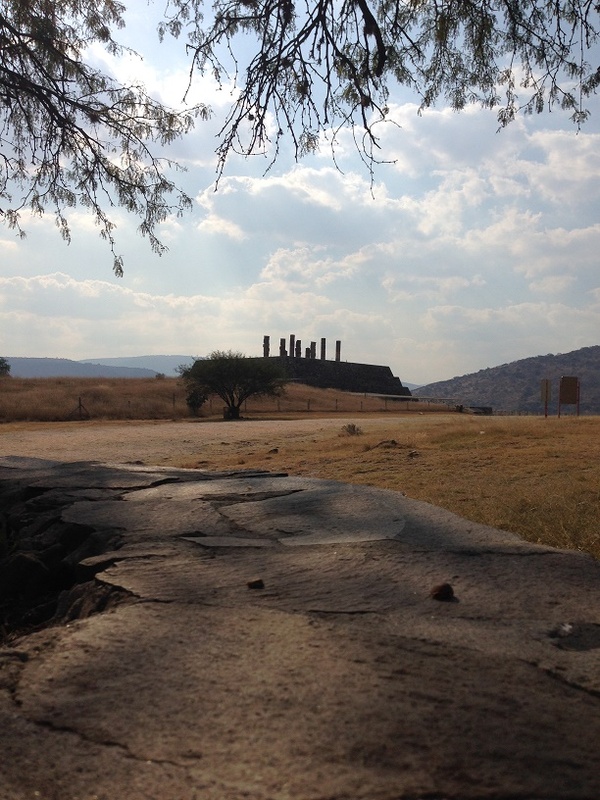 I would’ve been perfectly to miss out on one of the most stunning archaeological sites in the Americas, the former capital of the Toltec empire. But what kind of Adventure would that be? I set down the book and hopped on the Giant. You can take a city bus to the pyramids, but I liked the idea of cycling across town. The Tula Archaeological Site is located just a few kilometers from the current city center, surrounded by neighborhoods on two sides. After confirming directions I set off. The route crossed the river and immediately went up a giant hill, the opposite side of the gorge I’d descended a few days before. Barely able to breathe at the top, I made a mental note not to try pedaling up it when the Giant was fully loaded with gear. After that the ride was easy. 10 minutes later I coasted into the Tula National Park, home of the Archaeological Site. It had a landscaped entry and vast parking areas, all almost empty. Maybe it was because it was a Monday, but Mexico’s archaeological museums always seem drastically under-attended to me. As I wondered where to chain up the bike, a security guard suggested I walk it right up to the front door of the museum and lock it to a tree. That done, I paid my entrance and spotted a sign near the entrance. It kindly informed me that I could report any complaints “or insults” by phone, mail, email or in person. I wondered how many insults I should expect. 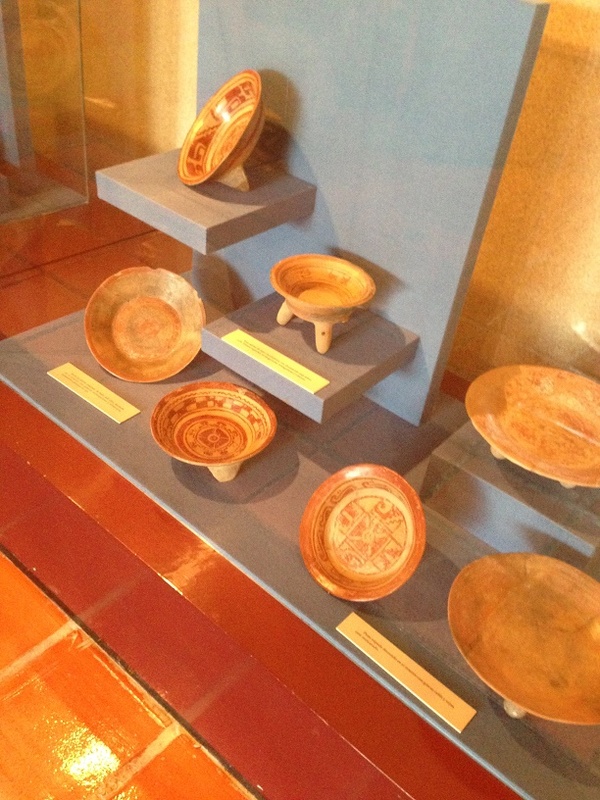 Toltec or pre-Toltec pottery in the museum. Photo by André. The Tula archaeological site consists of three main areas: first the indoor museum, with replicas of many of the artifacts and the usual informational panels. Then a long outdoor walk from the museum to the pyramids themselves. (I suppose they couldn’t break ground for the museum building too close to the archaeological site). Finally, the remains of ancient Tula’s downtown, which have been painstakingly unearthed by archaeologists. I wasn’t too interested in the museum, not because I dislike them (I love them) but because I was eager to see the real deal. But I’m glad I walked through. I got a lot of interesting background information on the culture and the art that I’d see. And the three dimensional model of the site would help me orient myself once I got out there. The walk out was surreal. Sometime I think Mexican museums have self esteem issues. I’m not sure they believe people will really come just to see pyramids and amazing artifacts. There’s always some kind of side attraction, a sort of “AND you get to see…” to sweeten the deal. In Tula’s case it’s this desert version of a hedge maze. White rocks and cacti sprawl along winding, tangled pathways. 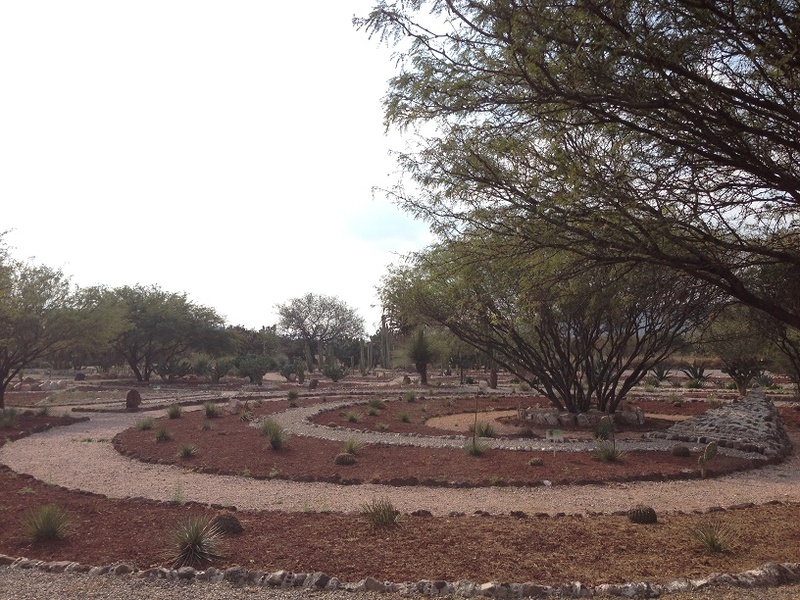 I stuck to the outside, skirting past the labyrinth and heading for the Toltec ruins. Part of the labyrinth side show. Not quite David Bowie material. I wasn’t there yet, though. The path is a zig-zag, making right angle turns that nearly double your walking time. This has two effects: you can’t directly see the pyramids until you turn the final corner (kind of cool), and you’re forced to walk through repeated encampments of vendors hawking their wares (moan). I assured row after row of peddlers that I needed neither a jaguar statue, nor a traditional flute, nor even a handmade rosary. Ironically, if any of them had just offered me a bottle of ice cold water I would’ve thrown pesos at them. Finally I reached the pyramids themselves. My first view was from the end of the trail, with the main pyramid framed perfectly by a lone shade tree and a little bench at the trail head (image at top). Fluffy clouds filtered the desert sun and the whole place looked serene and magical. I was happy I’d come. To one side was the remains of the ball court. I think we all know about the Mesoamerican soccer-like game where the losing team was sacrificed, so I won’t go into that. What struck me was how profoundly practical the structure was. It wasn’t that different from a stadium today, and was optimized for handling a giant amount of people. I could picture a family tripping up the stairs with kids in tow, trying to pull the niños away from vendors at the entrance (probably selling jaguar statues). The fact that lives hung in the balance was as prosaic as an NFL player pulling a hamstring. 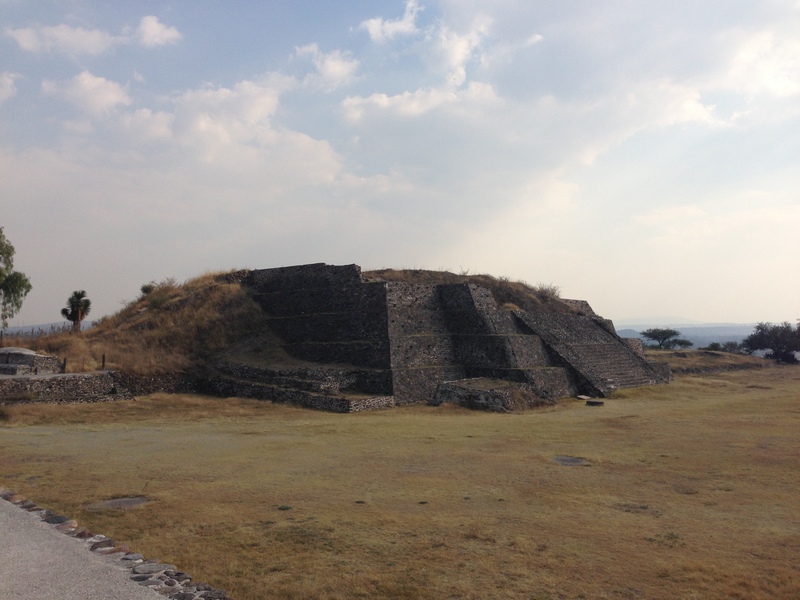 Next I went to the main pyramid, dedicated to Quetzalcoatl. The trail approached from the rear. On the far side was the central plaza of ancient Tula, surrounded by the remains of dozens of public buildings. There was nothing I wanted to do more than run up to the top of that pyramid, but I took my time, wandering around the back first and looking at the carvings in the reconstructed perimeter wall. I was glad I did—these are things I wouldn’t have taken the time for after I’d already been to the top, and they were stunning. Finally I made my way around front. 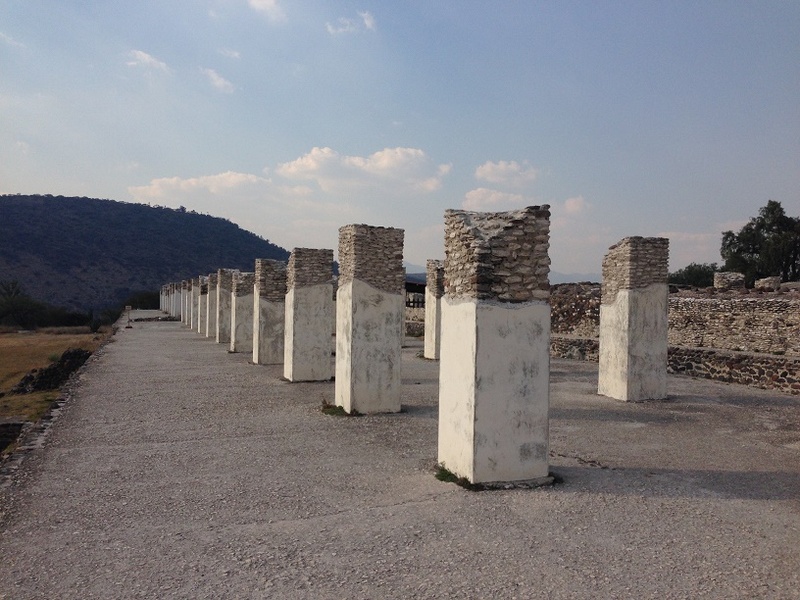 Hundreds of white columns rose from the ruins of an old palace to my right, but I focused on the pyramid. A few other groups of visitors milled about, some on top, some around the bottom and one pair coming down. I sized up the steps and began the ascent. Ruins of the Palace. Photo by André. I remember that when I climbed the steps of Chichén Itzá I was terribly winded. But I was in worse shape back then, and I took this pyramid with ease. Even so, coming up eye level with the top was a powerful experience, one that made you feel as if suddenly you couldn’t go on. I found myself looking up at the Atlantes, the 12-foot tall stone warriors that hold watch over the temple’s top. I placed my hand over my heard in a discreet salute and stepped up. It’s hard to write about standing atop the pyramid. It’s like this is where I’m supposed to say something deep, because I’m looking for the gods, right? But I feel like I said everything I had to say in the video log I sent my supporters. The truth is I felt conflicted. It’s this spiritual place, but it’s also a museum. I was surrounded by other tourists each having their own experiences. The top of the pyramid seemed to be a concrete slab, which made me wonder how it had been reconstructed and whether the Atlantes were even in the right places. I think the most profound spiritual experiences happen in places of solitude; and this temple is now a place of learning and selfies, not so much a place of prayer. But there was an undeniable majesty looking out over the old city forum, vaster than some towns itself and now completely empty; the palaces and temples and the other pyramid, in worse condition, not far off from this one. All of it haunted by the specter of the sacrifices that once took place there. How can you look down from that spot, picture the city as it once was, and not imagine the knife coming down? The other pyramid. Photo by André. As I stood contemplating this a young Colombian couple asked if I’d take their picture. We conversed in Spanish (I’m on a roll!) but they seemed eager to be off. I watched them make their descent on the giant stone steps. The sound of a flute drifted over the site, played by an enterprising vendor who’d eschewed the merch stalls to wander with his wares. It was right to hear that plaintive trill over this empty place. And it was time to make my offering. I accepted that other tourists would watch me do this, including a group led by someone with the air of an anthropologist. But they kept a respectful distance, and the incense lit easily. I tucked it into a crack at the top of the steps, in view of the Atlantes. This incense comes not from me, but from my friend Sky and from Guadalupe, whom you know by another name. Today is her holy day, and she sent this for you. I hope the scent will please you. The smoke curled up to the sky and the flute broke the silence. Does Quetzalcoatl miss the taste of human sacrifice? Or was it something he never wanted in the first place? I descended. On the way out I took off-road footpaths used by the vendors (they sure weren’t walking at right angles after a long shift). This saved time and evaded most of the sales pitches. After the final jaunt across the labyrinth it was back to the museum, the Giant, and the road home. When I got there the hotel owner had another present for me. “Are you staying another day tomorrow?” he asked. That took me back. This time I confirmed that I’d understood correctly. It seemed like too much: a free breakfast is one thing, but comping me $500 pesos (really $600) is big. I wondered what the catch could be. But in a situation like this, all I have to go on is my sense of people, and my sense of Roberto is that he’s a friendly, kind person. I felt humbled by the offer and gratefully accepted. Bridge in Tula de Allende. Photo by André. That extra day allowed me to work ahead on client projects and explore the town some more. 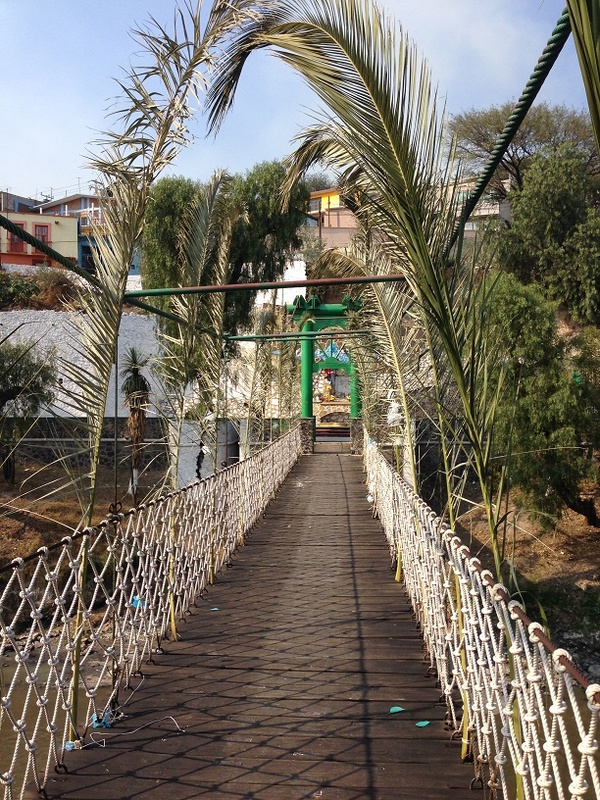 Discoveries included rope bridges crossing the river in the center of town (not decorative or for play—these were functional rope bridges used as pedestrian thoroughfares). They anchored to a cute neighborhood on one side and a sort of mini park on the other, and helped connect the two halves of town. Unfortunately, the river smelled like an open sewer and I didn’t spend much time in the park. Tula marked a turning point in my Adventure. It was the first time ever that I’ve had good enough Spanish to make friends and be social without the “in” of a local acquaintance or a language school. Even though I’d felt lonely and isolated when I showed up, I managed to experience moments of warmth with people I’d never met before and will likely never see again. For that, I’m grateful. Cool old car in Tula that made me think of my Dad. Next time, I leave Tula and get back on the highway—but I have to crash a gate to do it. Until then, check out my other road logs. How the city seems to ruin everything in comparison, though some gods are in it too, which, I suppose, makes it worth while. I’m thinking of the fleeing or flying options here. It’s good you decided to flee the hotel to fly. Have been turning this one around in my head for a while, Camelia. All I can say is it put a smile on my face. I agree there are gods in the city.